I have heard tell that the present Secretary of State for Education here in the U.K.,Mr Michael Gove, has stated his preference for a return to a more conventional history which should become a major part of a new curriculum for primary schools. It is the “Good Kings and Bad Queens” style of history (or should that be the reverse?). Now I have always had a deep fascination with history as a subject. I understand, as a politics graduate, the importance of great leaders in shaping the direction of great historical events. I am not for a second trying to decry their achievements (or in the case of someone like Adolf Hitler or Josef Stalin, their malevolent influence). But it concerns me that “history” can become so narrowly focussed that we go back to the idea that, in British terms, it is merely the study of our monarchs and the great events (or little ones) of their times that should be the focus of our attention. It wasn’t until I was at university that the word “historiography” came into my vocabulary. 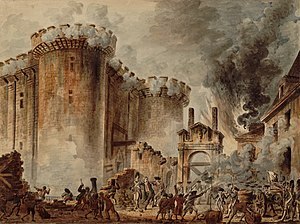 I had studied history up to Advanced Level in secondary school and the French Revolution was seen as a series of events that produced a definitive outcome. I was told to read a book by someone called George Rude (pronounced rude-day) who said it all and that if I read this book I would “know” the French Revolution. Only later did I discover that what I had been taught was a simplistic collection of some events put together to make a story that I believed was the “French Revolution”. It was this fundamental belief that there is not one particular type of history that led to the “looking at sources” view of history teaching that became very popular in the 1980’s when I taught the subject up to A Level in secondary schools. I remember looking at the history of the Northern Ireland “Troubles” with two students. They wanted me to define a path of exactly what had happened that had caused all the bloodshed and and the problems of co-existence between Catholics and Protestants. I told them to go and find some source material and then to derive their own view. They said that the process of discovery about the “events” was fascinating and that they had no real conclusion. They found out that history is muddy and indefinitive. I therefore return to Mr Gove’s desire to return to some golden age of teaching and learning in our schools. I do not believe that there is any “official history” that must be taught to our children. I believe that history provides children with an excellent resource to research, to write, to read, to discuss and debate. In fact it is a brilliant subject for the development of many skills that children will need as they learn to cope with the vastly changed world that they will be growing up in. Was there ever a definitively bad King?.. ah yes you may say, King John, or King Richard the Third… but on closer examination they may not have been as bad as they were presented by the scribes of the powerful who could define the official party line about them. How they came to be defined as bad is a good point of departure for children studying them and whether they could ever be called “bad” is for the children to decide for themselves.